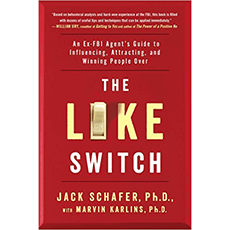 “The Like Switch” is former FBI Special Agent Dr. Jack Schafer’s guide to influencing, attracting, and winning people over. In this book, he offers proven strategies on how to instantly read people, influence how they perceive you, and turn on the like switch. I have it on Audiobook, If I haven't listened to it 20 times I haven't listened to it once. A No BS Book, I've used everything taught in the book and have taught it to many. It Works. I highly recommend to everyone.